Pale Rider is a classic Clint Eastwood Western that returns this Hollywood star to his humble beginnings after 9-years and unlike those classic Spaghetti Western’s, Pale Rider is a much more serious endeavor. The story itself revolve around your classic Western archetype characters that include the villainous Coy LaHood (Richard Dysart) and the mysterious cowboy known as the Preacher (Client Eastwood). When mining boss Coy LaHood unleashes a plethora of savage threats on the independent miners within the region, a strange and mysterious preacher arrives who challenges the status quo. This unfortunately has a huge impact on Coy LaHood who then hires a gang to dispose of the preacher and from there, this classic Western begins. Pale Rider is also directed by Eastwood who shows the viewer his unique insight into the wild west and makes good use of the surroundings that truly captures the American country side and spirit. The ending of Pale Rider is a thoroughly thrilling and quite a suspenseful scene that is still one of Hollywood’s great endings that will leave the viewer yearning for more. On Blu-Ray, Pale Rider is quite an impressive film for its age that although may not be the most exceptional video quality, Warner Bros have manage to capture the unique look of the film which has also been digitally remastered. Unfortunately for movies of this age, noise will generally always be a problem, however when compared to the DVD version, the difference is quite breathtaking. Match that with True Dolby 5.1 audio and this sounds phenomenal through your surround sound setup that assists in truly immersing you into this classic Western. 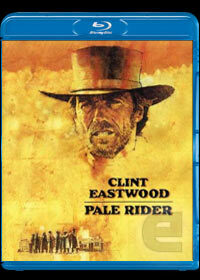 With exceptionally sharp audio, a gripping soundtrack, Pale Rider is truly a cinematic experience on Blu-ray.